A CUSTOMER service course certified by the Singapore Workforce Development Agency (WDA) is being shortened, with parts of the training to be conducted online, in a bid to reduce classroom time. 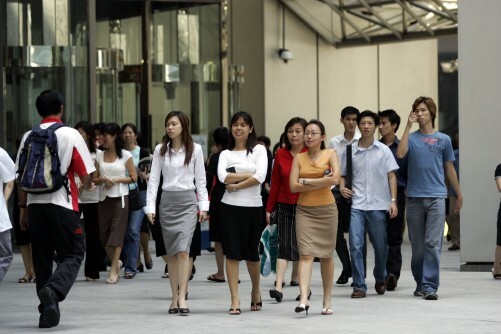 The aim is to encourage employers in the sector to free their staff for training and skills upgrading in the midst of a tight labour market, The Straits Times understands. The WDA has asked consultants, which provide the five-day Workforce Skills Qualifications Certified Service Professional course, to develop a shorter programme to "ameliorate some of the pressures employers faced in releasing staff for prolonged classroom training". WDA programme and skills development division director, Ms Loh Gek Khim, said the new course, which starts in the middle of next year, will also "incorporate content such as latest industry trends, know-how and best practices". This is the first major revamp of the course since it was launched in 2008 by the WDA. Some 35,000 workers have attended the programme so far. The Straits Times has also learnt that online learning for the course will be introduced to reduce classroom hours as part of the revamp. Some 250 participants will be able to go online each month to learn about service concepts and pick up tips. An unusual requirement that the WDA has made is that e-learning modules have to include online games, so that trainees can have fun while upgrading their skills. Industry players like Mr Bentley Williams, founder of local customer service consultancy Wow! Academy, welcome the reduction of classroom time. Many, however, say that online learning has to be part of the course, and not replace classroom learning. "Nothing can replace face-to- face learning with a trainer," said Mr Williams, who suggested the creation of an online forum where trainees can exchange ideas and discuss real-life experiences after they complete the training. Assistant teacher Norsidah Omar, who attended the five-day training course last year, said that the WDA could also consider offering short refresher courses for past trainees. "This would help us practise and update our skills," said the 25-year-old. MP Zainudin Nordin, who is also chairman of the Government Parliamentary Committee for Manpower, said the revamped training course can boost productivity and help raise wages. "If training can help them improve their skills to better serve customers and attend to more customer needs, it can reduce the reliance on manpower," said the MP. "And if their pay goes up when they perform better at their jobs, it will be a bonus."